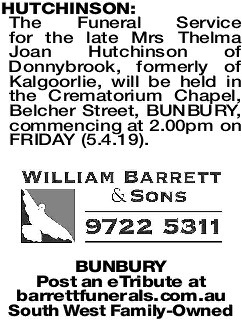 The Funeral Service for the late Mrs Thelma Joan Hutchinson of Donnybrook, formerly of Kalgoorlie, will be held in the Crematorium Chapel, Belcher Street, BUNBURY, commencing at 2.00pm on FRIDAY (5.4.19). 29.11.29 - 30.3.19 Passed away at SJOG Bunbury. Loving Wife of Graham (dec). Mother of Alan, Ruth, Mark and Carol. Mother-in-law of Julie, Ron and Peggy. Nana of Barbara, Dianne, Julie, Danny, Joanne, Steven, Adam and Carmen. Great Grand mother of Ryan, Luke, Jamie, Kaley, Corey, Neve, Isabella and Soleece. Reunited with Dad. Passed away suddenly on March 30th 2019 in her 90th year. Beloved Mother of Ruth. Mother-in-law of Ron. 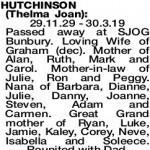 Grandmother of Danny and Kim, Joanne and Craig, Steven and Adam. Great Grandmother of Kaley, Corey, Neve and Isabella. We will all remember the wonderful family days at your house which kept us all together. Rest in peace, Mum. Goodbye Mum. Love from Mark, Peg, Barbara, Dianne and Julie. Ryan, Luke and Jamie. See you on the other side. Rest in Peace. You passed suddenly from my life on Saturday, but you will never be gone from my heart. You were a wonderful Mother. I am so grateful we had the time to be close again. I love you Mum. Your loving daughter, Carol. 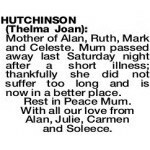 Mother of Alan, Ruth, Mark and Celeste. Mum passed away last Saturday night after a short illness; thankfully she did not suffer too long and is now in a better place. Rest in Peace Mum. With all our love from Alan, Julie, Carmen and Soleece. 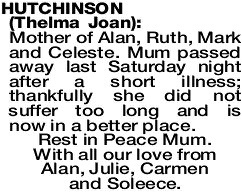 HUTCHINSON THELMA Loving sister/sister in law of Ken and Glenys Barker, Aunt and Great Aunt to Stephen and Alison and families. Died peacefully after a long life, full of care and love.